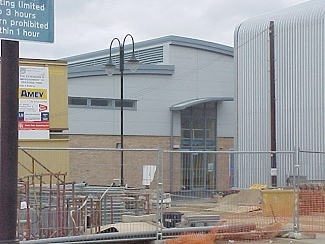 Ely In The UK - What's Being Built? The Changing Face of Ely. The New Paradise Pool is now open! A welcome addition to Ely's facilities. We hope to bring you exclusive pics inside very shortly. 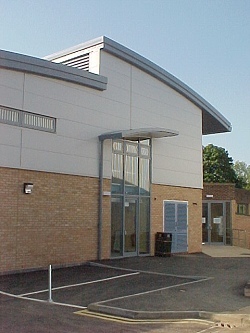 The front/entrance to the new pool. 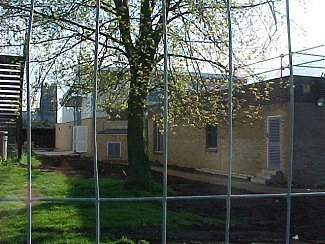 This pic was taken on 12th April from on the Paradise playing field looking through the builders fencing - the Cathedral can be seen in the background. There it is! Over the cars - the curved roof can clearly be seen, its gleaming grey pvc steel sheeting matching the angry Ely sky. 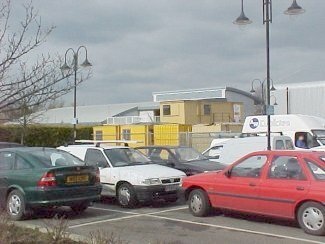 The yellow portacabins of the construction company can also be seen in this our first pic taken during March 1999. Estimated completion date is still - "sometime in April"